BY GEORGE ARTSITAS — Today was a solid day to be from Eugene compared to the onslaught of bad ones that’ve started this week. The Men’s Basketball team went down to L.A. to face off against the woeful USC Trojans and came away with a 76-74 win. The Ducks played down to a team that just lost their head coach a few days ago but snuck away with a win. Defensive Coordinator Nick Aliotti, was offered the same position by USC and promptly turned down the opportunity to stay with the Ducks. Can’t say I blame him. I wouldn’t want to follow Monte Kiffin anywhere, even if I was a spy. 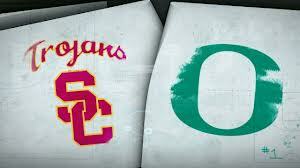 Today, Oregon gets much more than a very forgettable win against USC. It gets Aliotti back. Now if Chip could just think about changing his mind again.